Pants waiting to have patches ironed on. Today I'm working on repairing lots of different things. The kids' mending has really been piling up. My daughter went through a phase last winter where she ripped her clothes basically every time she wore them. She even managed to tear her gorgeous Scandinavian Hartstrings $80 sweater dress at church! And this was Lutheran church, too, not some Holy Roller, Bible Beating type of service. Luckily I got the dress marked way down, but still! I sew the hole with zig-zag stitching, then hide the repair with a patch. One of the pairs of pants I'm mending today came from a friend already torn, but the others are all her. 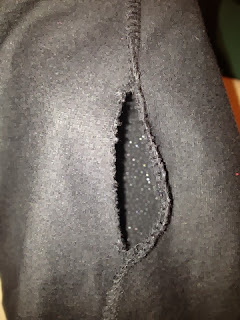 Even her brand-new, worn-once birthday black sparkle leggings are torn. 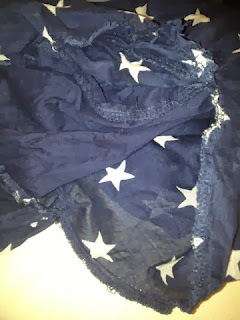 I loved the Harajuku star maxi skirt when I purchased it, but she steps on the hem and tears this ruffle out every time she puts it on. A few days ago I had to sew my teen's fitted sheet up because he'd ripped out one whole corner. It never ends! The Harajuku skirt with a repeatedly-torn ruffle. 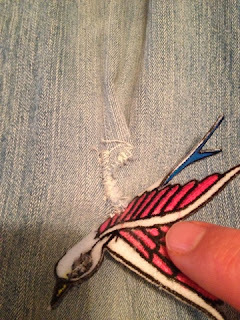 In the case of the pants with the torn-out knees, I'm sewing the holes shut with zig-zag stitching and ironing on patches over them. 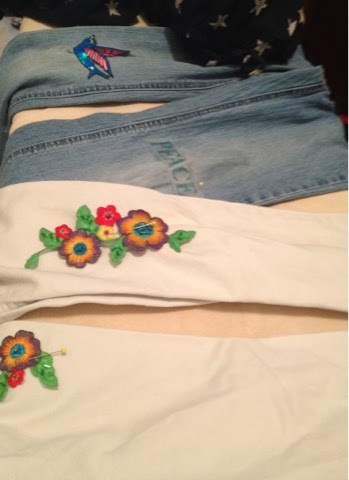 Luckily these DIY Bling patches are really in right now, so it's easy to find a match for very little money. I got my daughter some iron-on rhinestones so she can add extra sparkle. I hope it will encourage her to be a bit more careful with her clothing. Brand new leggings, worn once, with the seam already ripped. I also started on the new box of dolls today. There are a few in there that hardly need any work before I can sell them. There is a stunning 1930s composition bride with the Madame Alexander Wendy Ann face. I don't think she is a Madame, because although she does use the same face mold and has the side-glancing eyes, her paint is slightly different and her clothes are pinned to her body, which Madame Alexander usually didn't do as far as I know. The original owner thinks she may be a Junel, so I assume that's true. 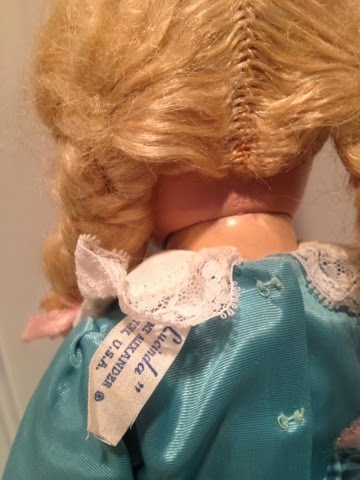 Since companies shared their molds back in the day, it can be virtually impossible to identify an unmarked doll. Wendy Ann and Nancy Ann get some air. Wendy Ann is all-original and nearly perfect, amazing for an octogenarian! One shoe is starting to disintegrate, and her satin wedding gown, lovely 30's style, had some marks and pinholes. I gently cleaned the stains with carpet and upholstery spot cleaner and set her in the sun to bleach them further. Wendy's main flaw is a musty odor, like a basement or attic, where I assume she's been residing for a few decades. The sunlight and fresh air should remove it posthaste. 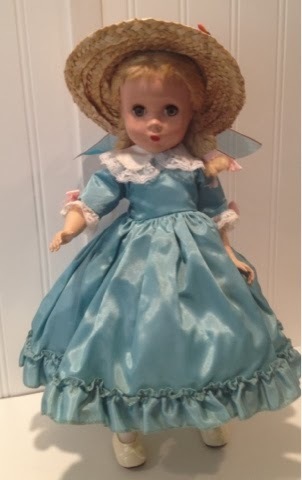 Then there is a near mint Nancy Ann Storybook bisque doll in the lot. I have to do some research to see if I can identify this little lady. She wears a darling black houndstooth dress trimmed in green and a green felt hat, still crispy and new-feeling. She also had a bit of an odor from storage, so I put her in the sun as well. When I get done with the mending there's the usual laundry mountain to work through. And I have to bake three dozen cookies for the Fall Festival (Halloween party) at pre-school tomorrow. And produce a Merida costume from Brave, because the Disney Store version costs $70. And clean, because my four-year-old is complaining about the house being so dirty since I've been sick. Oh, you ask, is that the same four-year-old who spilled blue paint all over the bathroom floor and rug immediately after I cleaned them last week? The one who cut up minuscule slivers of paper and left them all over the floor? The one who knocked over his milk and watched it pour off the table while he just sat there so I had to mop the floor yesterday morning before school and didn't get to eat breakfast? Why yes, it is he, the very same. Oh, Wendy Ann faced bride doll, are you sure you want to go through with this? Aren't you a little young and delicate for this hard labor? Pretty soon, despite all this work, I'm going to take a nap. 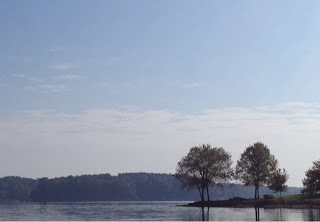 I'm better than I was, well enough to walk very slowly on my walk and down to the lake, but still easily tired and still with this constant headache. On my way to the lake today I encountered a snake on the sidewalk. This type of snake is harmless; I dug one up when we were putting in the garden last spring and looked it up to make sure, but now I no longer remember the name (another casualty of motherhood, Wendy Ann, just so you know!). Anyway, when the snake saw me coming he stuck his head under a leaf and lay very still, just as if he were pretending to be a fallen branch with a leaf still attached. I got a kick out of it. A haze of humidity over the lake. Last week we had heavy frost, so I had to bring all my unripe tomatoes in. We had twenty-two good sized ones still one the vine, so our windowsills are all taken up by tomatoes. 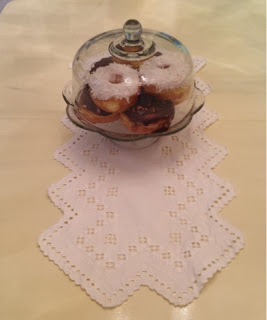 You can see them in the background of my Breakfast Nook post if you look closely. Now, however, it got warm and humid again. 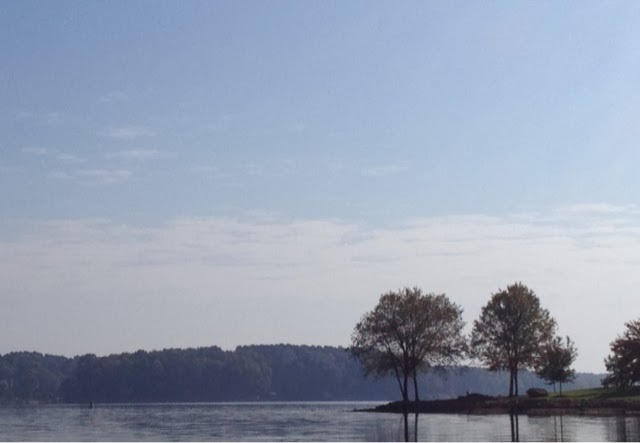 I could see the haze of humidity over the lake yesterday morning. 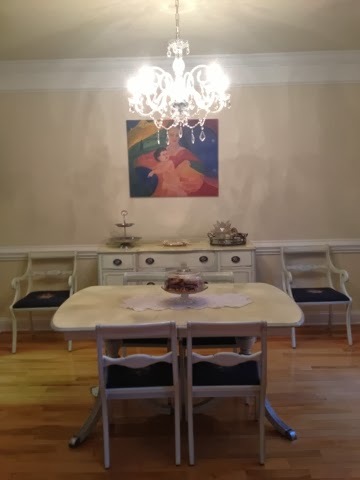 I think this is a pretty scene, perhaps worthy of the new dining room painting I'm thinking about. I guess I'm going to have to clean my office as well. Jerry has been threatening to "organize" it for me. If he does so I won't be able to find anything. You know, it's been proven in several studies that people with messy work spaces are more creative. Now, though, my daughter is starting on me. When I was shipping stuff to Russia this morning at 6AM she came in and offered to help me clean it. So, maybe it is a bit overly messy! Finally, yesterday I proofed my recent blog entries again because I found so many errors reading over my eBay listings. Every single one had flaws, so I worked on fixing those last night. Now I'm going to have to go way back and read over everything because it drives me crazy. No matter how much I proof-read, always the typos! I'm going to have to turn my writing degree back in! The Wendy Ann and Nancy Ann dolls shown in this post should be available in my store shortly, so please do check: http://stores.ebay.com/atelier-mandaline. Last night I managed to drag myself up to my office to work for a bit, and here is the result, another Polly Pigtails doll finished. 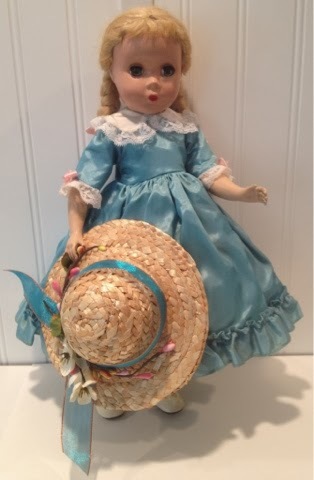 Polly Pigtails, made from 1949-1951 only, is a very rare doll. When I listed this one she was the only original vintage Polly on eBay; all the others were reproductions. 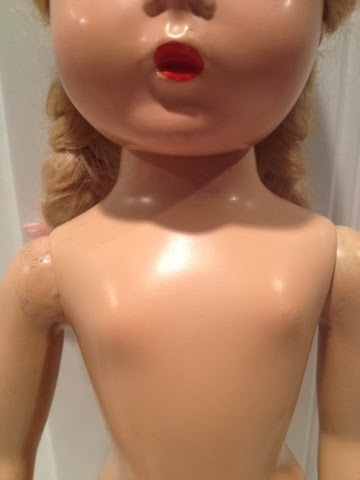 It's funny how these unusual dolls come up in spurts. I sold another Polly a few months ago. 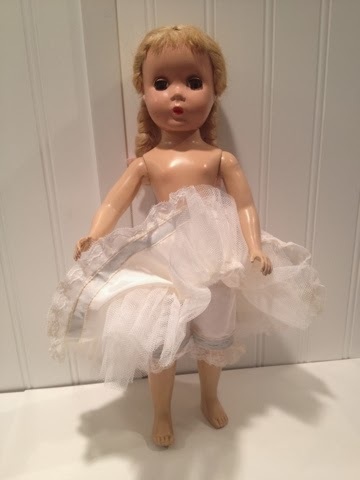 When I bought my daughter's Sweet Violet two more came up right away, and I've even seen another Margot Ballerina with the super-rare wig I sold recently. So what eBay shows us is even rare items are findable if you know where to look! Polly is in excellent shape. She's all original, even down to her hair ribbons, I think. 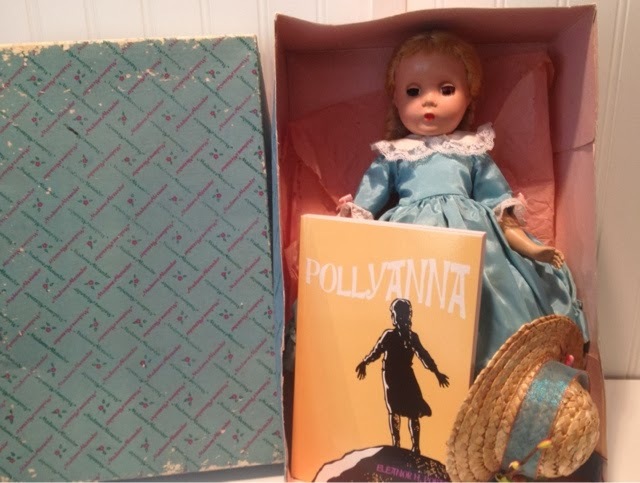 This Polly is in just fabulous shape for such an early doll. If she hadn't lost all her original clothing I'd be asking around $700 for her. She does have the usual age-related issues. Her shoulder, neck, and hip joints have paint scraping. There is a tiny chip in her face paint right above her mouth. This doesn't go all the way down to the plastic, so it's just a difference in texture, not color. Her bangs have some breakage on the ends so they look a bit uneven, and her hair is a little thin on top. None of this is severe at all, so I didn't do anything to mess with her originality. She has a slight chip above her mouth, and a brown mark on her forehead, both very minimal. Polly's face and body paint are superb, retaining a trace of blush in her cheeks, chest, knees, and the tops of her hands and she also has a hint of her original brown eyeshadow left. Her lips had some paint loss so I touched those up and sealed them. Someone gave her new stringing recently enough that it's still very tight and she poses beautifully. 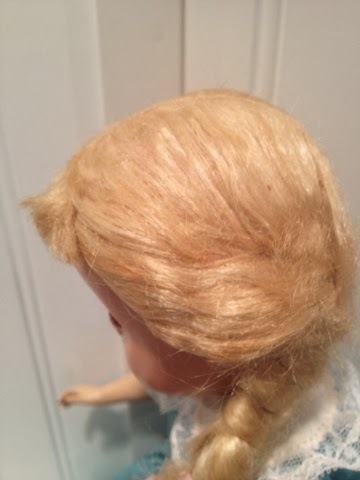 Her mohair wig has slight thinning and breakage of the ends but retains its original style. I think someone gave her a makeover other than stringing. Her hair was powdered when I got her, especially under her bangs and behind her braids. I just dabbed the powder away with a damp towel. It may have been applied as a mold-preventative. Mohair and wool are prone to mildew and moth damage. Since I removed the powder, the new owner will want to keep an eye on that and handle the doll frequently to check. Her joints have slight paint scraping. The back of Polly's head is more pink than the rest of her face and body. I'm not sure if that is due to painting or, more likely, she spent a long time lying on her back and the other paint became discolored from age. 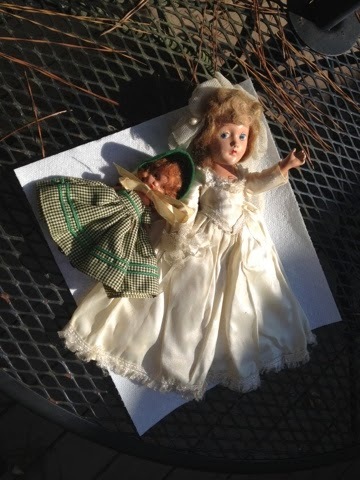 This is not visible to any casual observer, though; you have to be really studying the doll to see it. Polly re-dressed in a vintage "Lucinda" costume. Since Polly was a blank slate I decided to make one of my exclusive doll and book sets. I do a lot of these, especially around the holidays, and have a lot of success with them. 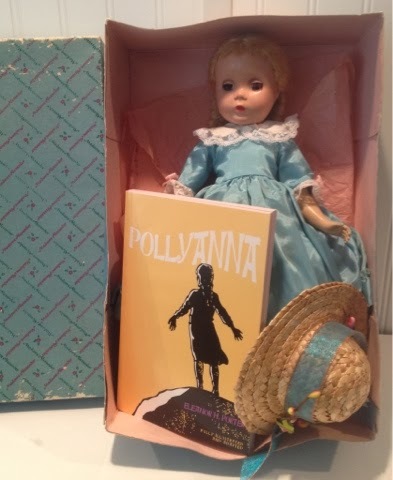 I enjoy uniting my two childhood loves, books and dolls! My own daughter receives a doll and book set for pretty much every occasion and she's become a wonderful reader. 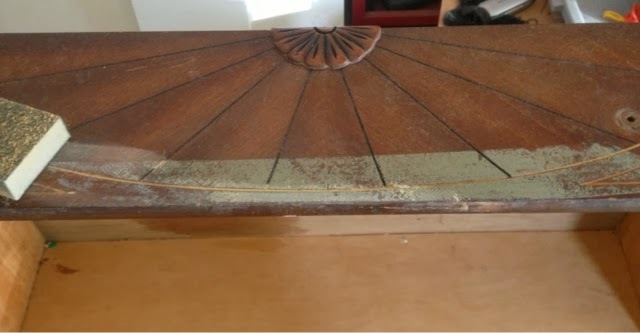 The vintage box has lots of wear. I took a vintage 1960s Madame outfit from my stash, originally for "Lucinda" and found it fits Polly perfectly. This outfit had some yellow and brown spots from age or mildew. I was able to remove most of it from the dress by spraying it with white vinegar and setting it out to dry in the bright sun. 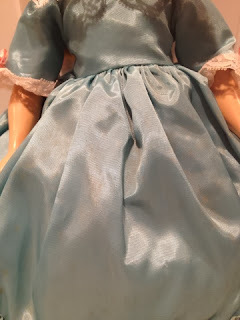 I wasn't able to fade the darker spots in the crinoline and pantaloons, though. Since these are in the back and under the dress they aren't visible, though. All the outfit pieces have brown spots. The spots are worst on the back of the undergarments. Polly Pigtails always wears her signature straw hat, so I found a new-old-stock vintage hat to fit her. I happened to have organza ribbon in a perfect match to her dress, so I trimmed the hat with that and vintage-look flowers. I think the outfit turned out well. Polly looks super-sweet in my doll case! The mohair wig has some fuzziness. I had a brand-new copy of Pollyanna, purchased for this express purpose. I was just waiting for a suitable Pollyanna to come along. I had the original Lucinda box as well, so I put together a gorgeous boxed set. I hope the new owner gets as much enjoyment from it as I have! On the home front, Jerry sanded the top of the other kitchen bench with the belt sander to get it ready for me to colorwash and painted the base with chalk paint. 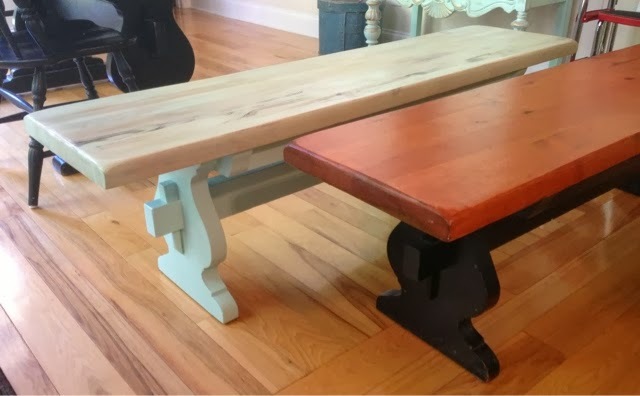 The children, despite every one of them having flipped the benches over and beat their heads on the wall in the past, insist on tipping the benches all the time during meals and homework. When Jerry went to paint this one he found one foot just hanging on by a thread. It's a good thing he noticed it, because the whole thing would have fallen over had he not. This led to his memorable speech at dinner last night: "People Who Don't Respect The Bench Will Have To Eat Standing Up." I hate to tell him, I was awoken this morning by the sound of the bench being tipped and thumping back into place. We live dangerously around here! 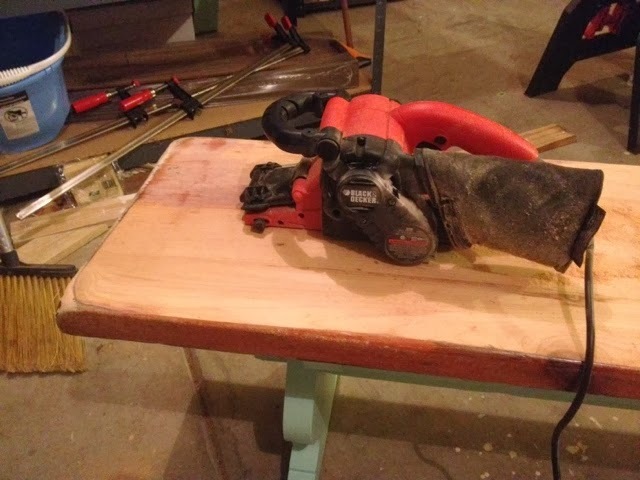 Jerry sanded the bench with a belt sander. 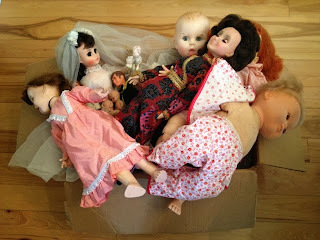 I just got an awesome, 11 pound box of dolls, all estate-fresh and stinky, dating from the 1930s to the late 1970s. There's a Harrison Ford in there, not sure is he's from Star Wars or Indiana Jones, and a Triki Miki Dollikin, a Nancy Ann bisque...I can't wait to get started! I feel slightly better today. Poor Jerry had to get up at 4 this morning to travel to a meeting. I woke up as well and started sneezing uncontrollably and couldn't get back to sleep. So I got up and took some NyQuil and was dead to the world until the bench banging. Since then I haven't taken any more medicine and my head only slightly hurts. 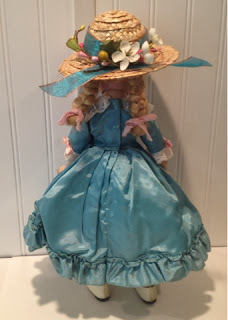 As soon as I'm back up to par I hope to get a whole new bunch of dolls listed. A new lot of dolls to fix. 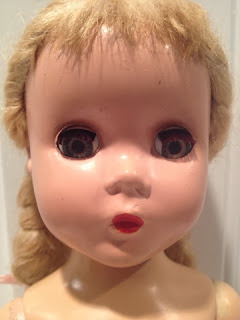 My favorite doll from this new lot, though, is the Ideal Baby Dreams "Velvet Skin" doll. This was my very first baby doll. I thought she was so beautiful! She has a cuddly body and soft peach flocked skin. Her turquoise blue sleep eyes have super-long black lashes. She wore a little pink bunting with a peaked cap. I was only one year old when I got that doll, but I can still see her face clear as day. For a long time I couldn't remember her name, though. The trouble with Baby Dreams is that her velvet skin turns brown and flakes off if you actually play with her. This is what happened to mine, and one day when I wasn't looking my mother THREW HER AWAY. Until I was 37 years old, I used to have the same dream. I left my baby in the entry way on the floor. I could see our 1970s California house like I was actually walking through it. Then, I would go back to get my doll and she would be gone. I would look and look to no avail and then I would wake up so sad. My mother would protest, when I talked about the dream, "Her face was peeling off! It was horrible!" Now, I understand this dream was not a longing for the doll so much as for my California life, which ended when my father died. 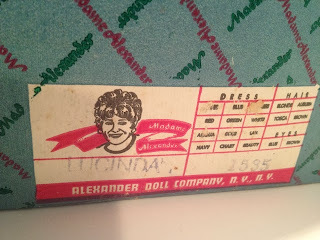 It's the same as the hula girl doll dream I wrote about years ago in this blog. Fed up with these nightly trips through the past, I searched for the baby I remembered. It took forever, but hours of trolling Internet doll blogs with the key words "flocked skin baby pink bunting " finally yielded the name. I got on eBay and discovered I wasn't the only person whose Baby Dreams suffered the skin peeling fate. The only new-in-the-box Baby Dreams was listed at $300 and even damaged ones sold for around $60! I watched it, though, and finally got myself one for a reasonable price. When she arrived I let my own daughter cuddle and hold her carefully and the rest of the time I keep her put away in a box. It worked like a charm! The dreams stopped cold. So, in some ways I guess you can go home again. I am excited to get this Baby Dreams into my store for some other long-ago little mother to rediscover. 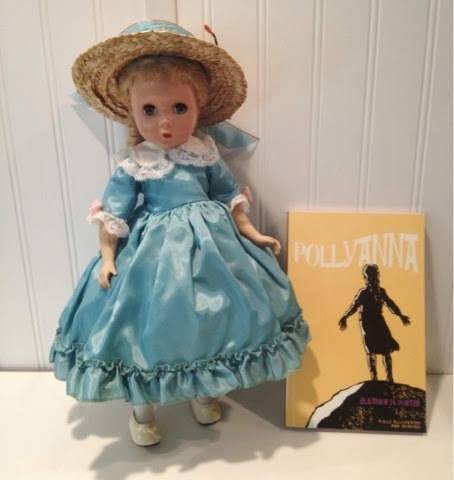 Polly Pollyanna is listed in my store right now and the rest of the dolls mentioned will be coming soon, I hope, so please check my store: http://stores.ebay.com/atelier-mandaline. 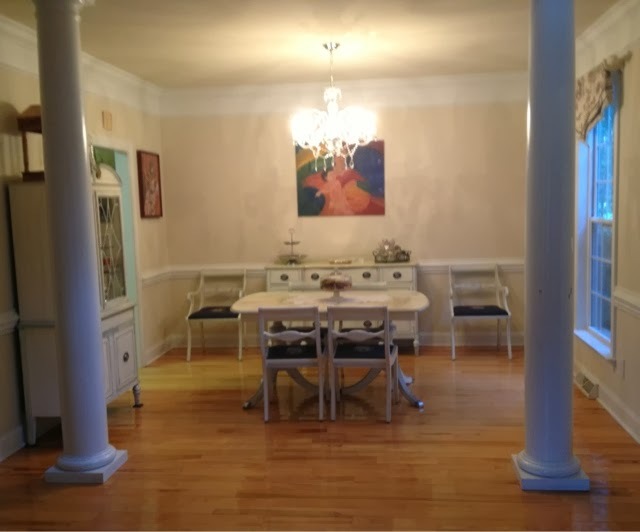 We finally got the dining room pretty much finished. 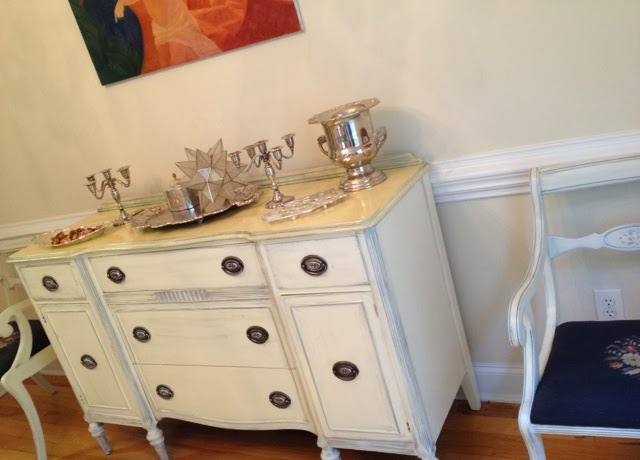 Now our dining suite is "antiqued" a gorgeous creamy white with silver accents. I moved my blue and white Spode "Winter's Eve" Christmas china into the china cabinet and brought out my wedding silver. I have some inherited crystal pieces I want to bring out still; they are in a high cabinet so I will need some help getting them. When the room is completely done I want everything to be silver and crystal with touches of gold and navy. I still want to move the oil painting to another place and paint a new one for this room. Besides the colors being too bright, this painting is too small for the wall I think. I have a large canvas ready to repaint for in here. I'm thinking of an rather abstract water or beach scene. 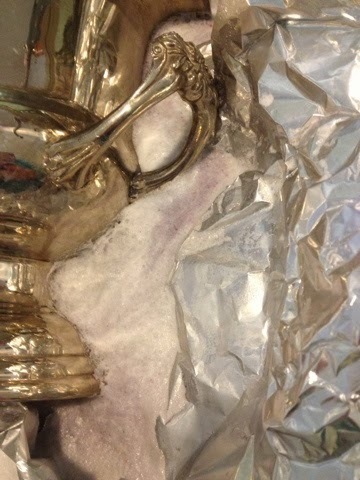 Since our silver has been in storage it's gotten pretty tarnished. 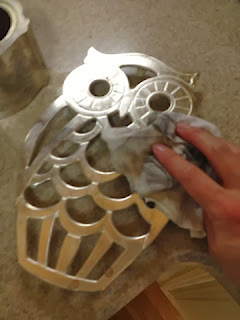 I also picked up a very tarnished but super-cool vintage owl trivet at an estate sale recently. I spent the afternoon cleaning and polishing my silver with my all-natural recipe. This cleaner is produced by a cool chemical reaction. Ingredients for all-natural silver cleaner. First, line your sink with aluminum foil. 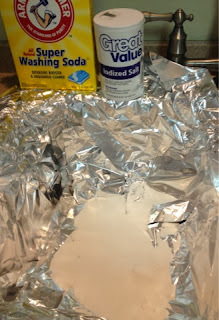 Add about a cup of baking soda, either regular baking soda or super washing soda, and two teaspoons of salt. Fill the sink with boiling water. The solution will foam up. 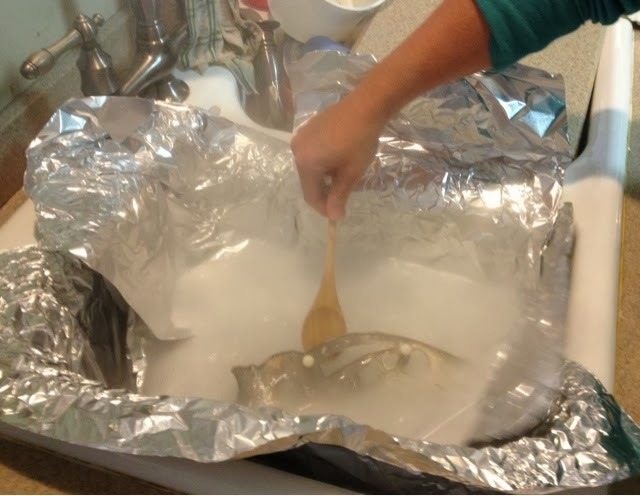 Dip the silver in the solution; be careful, it's hot! Place the silver pieces in the water, covering as much as you can, for a few minutes. Move the piece around to cover all areas. Be careful; the boiling water will heat the silver and it will be very hot! After a bit you will see the tarnish floating off into the water. 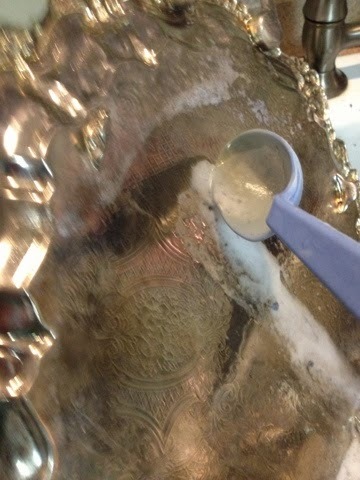 The tarnish will begin to come off in the water. For really large pieces, like my tray, use a spoon to pour the water over the whole thing. After several pieces the tarnish will really fill the sink. Jerry, walking by, said, "It looks like a Transformer threw up in the sink!" Pour the solution over big pieces to cover them. 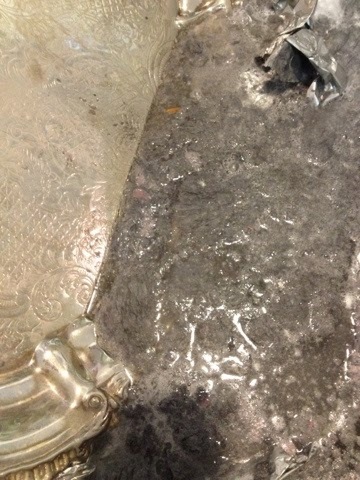 After several pieces the water will be full of tarnish. When all the pieces have been dipped, buff them dry with a clean rag. Lots of tarnish will transfer to the rag. Wear an apron, because it will also transfer to your clothing! Buff the remaining tarnish away with a clean rag. When you've buffed the tarnish away and the piece is dry, polish the silver with a polishing cloth or silver polish. 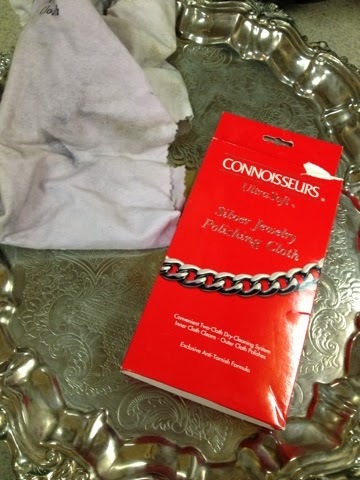 I use silver polishing cloths as dusting cloths at least once a month on my silver so I don't have to clean it as often. 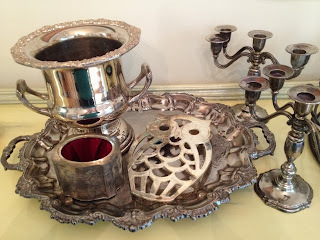 Polish and dust with silver cloths. I still don't feel very well and sitting in the cold at a band competition last night didn't help, so the silver polishing wiped me out and I had to take a two hour nap. Jerry suggested I might have mono, and as soon as he said it I remembered my friend in high school whose mono started with such a stiff neck she was taking muscle relaxers. I hope it's not mono; I sure don't have time for that! Jerry has really stepped up with the cooking, though. Last night he made delicious and low-carb peanut-encrusted tilapia and today he made me coconut chicken soup using my 6-hour broth recipe. I threw in oregano and thyme. Oregano is a powerful natural antibiotic and thyme is wonderful for respiratory complaints. 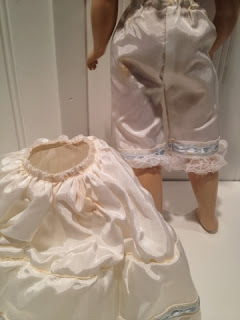 It revived me enough to go up and finish a new doll and book set for my store and do a bunch of the kids' mending. Looking at all the pastries in my photo set up, Jerry asked, "What is this, water-boarding for people on Atkins?" I do have sugar on the brain! We are trying this carb night diet from Women's World where you keep your carbs under 30 grams all week, but every fourth day you eat all the carbs you want from 6PM-midnight. This is supposed to switch up your hormone production and promote weight loss. I'm not seeing it so far, but carb night is a lot of fun! This embroidery is called Hardanger, after the region of Norway where it originated. The china cabinet filled with Spode and silver. Speaking of the eBay store, now Ebay has set it up so you have to have followers like Pinterest. I don't have a single one and it looks pitiful! So please, visit my store and follow me on eBay! http://stores.ebay.com/atelier-mandaline. 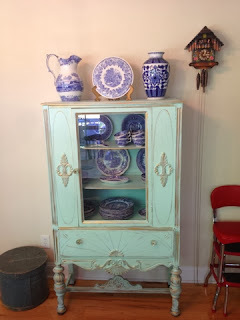 Our china cabinet before refinishing. About 10 days ago I mentioned we were finishing up the dining room makeover and had moved on to the kitchen set in our breakfast nook. In the breakfast nook we are using a combination of color-washing and chalk paint to redo our 1970s trestle table and benches, 1940s china cabinet, and modern chairs. 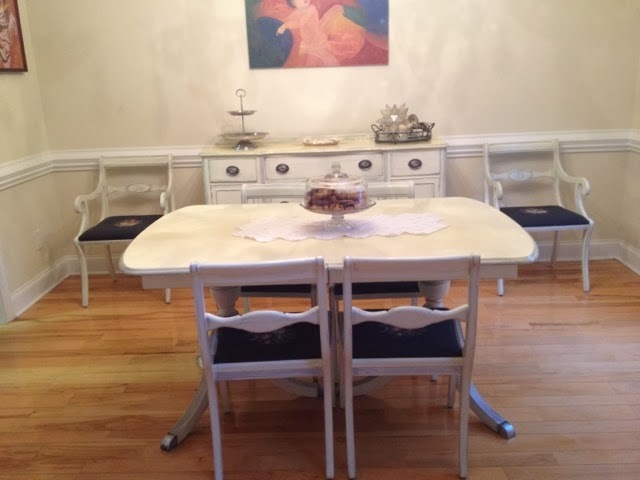 Despite a few setbacks, we have finished one bench and the china cabinet. I also sewed a window valance and set up the dining room this week. I'm glad I was able to finish something because I am not feeling well. I'm not sure what's wrong, but I think I caught what my grandmother called "A cold in your neck". Apparently there's some scientific basis for this old wives' tale. Many years ago in college I caught pneumonia. I was sick for a very long time. Then, only a week or two after I recovered I got what my mother calls a "crick" in my neck. The weather was record cold for the area one morning, like 17 degrees, and I went outside to walk to class when a blast of cold air hit my neck and it seized up so completely I couldn't straighten my neck. I had to go back to the doctor, who told me the pneumonia virus had migrated into my muscle. I spent another week in bed and ended up missing so much school it delayed my graduation until the next year. It would have only been a semester, but I decided to add a second major in the meantime, so it took an extra year. Ever since then my neck will seize up again every so often, usually when I haven't been taking good care of myself by getting enough sleep. Nearly a month ago we were up in the mountains for our son's band competition and cold wind was blowing on my neck making it feel like it might seize up. It didn't but it has been getting progressively stiffer and now I also have a headache in the back of my head that won't go away, earaches in both ears, runny nose and sneezing, sore throat, and upset stomach. I keep checking to make sure I can touch my chin to my chest, the way my mother used to test us for meningitis. I'm also just really drained. I only ran a little bit last week because I was just too tired. So, I'm proud to have gotten some work done. If I don't feel better soon I guess I'll have to try and find a new doctor around here to visit. The refinished bench in blue looks more up to date. 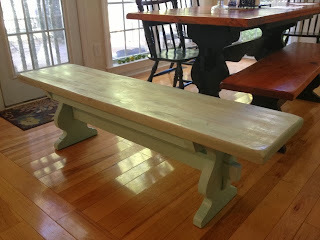 So, in my Every New Beginning post I showed you how to color wash wood as I did on one of the benches. The bench is finished now, and I think it looks very nice. When you compare it to the rest of the set you can see it looks much more up-to-date, not surprising, since the last time we refinished the kitchen set was in 2002! The tape adhesive stuck to the drawer, and the sanding block Jerry used to remove it. After the bench we moved on to the china cabinet. 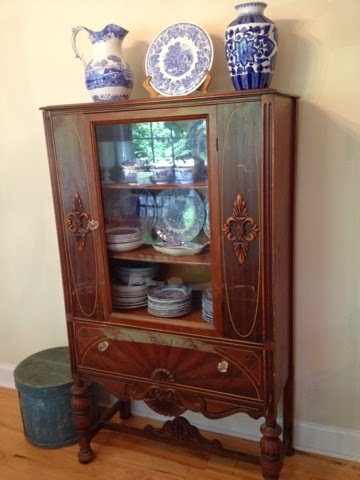 This cabinet, from the 1930s or 40s, belonged to Jerry's grandmother. In 1987 Jerry's parents moved with the cabinet. They stabilized the glass door and drawer with packing tape during the move. Unfortunately, after they arrived they just stuck the cabinet in an outdoor shed with the tape still on it. 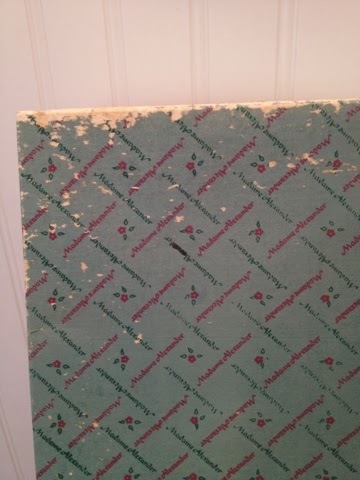 In 1997 they gave the cabinet to us, still with its packing tape attached. We tried to remove it, but the adhesive was stuck fast and hardened. Over the years I tried sanding, scraping, chemical removers like stripper, paint thinner, Goof Off, Goo Gone, scratching with razor blades, steel wool, all to no avail. I suggested painting the cabinet but Jerry didn't want to. So, for 16 years I've lived with the yucky tape mark on the front of the wood. Now, however, Jerry finally agreed to paint the cabinet. To say I'm happy about that is the understatement of the year! 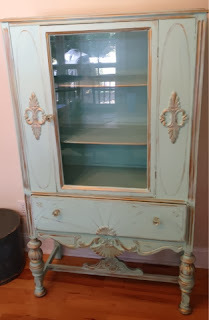 We decided to paint the cabinet with chalk paint and embellish it with Rub-N-Buff metallic wax, just as we did with our dining room set. The recipe for the homemade chalk paint is here: http://mandalineartfulliving.blogspot.com/2013/09/how-to-antique-furniture-dining-room.html. For this color I used Olympic Serendipity in semigloss and Rub-N-Buff in Grecian Gold. 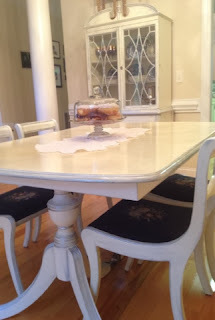 We used the same color chalk paint for the base of the bench and I made my own color washing glaze with the Serendipity and glazing medium. The recipe for the colorwash glaze is here: http://mandalineartfulliving.blogspot.com/2013/10/every-new-beginning-comes-from-some.html. Removing the tape also took the finish off. Jerry tried a sanding block and was finally able to remove the adhesive cemented on the drawer. The finish came off with it, but the surface was smooth enough to paint. Jerry painted the cabinet completely. I tried to help, but Jerry says the painting process helps him relax after his stressful job. 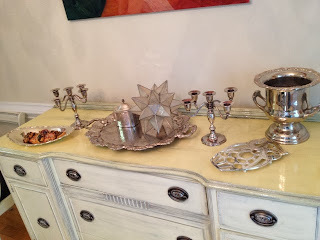 Once Jerry finished with the painting I went in with the metallic wax and just accented the carvings and embellished the finish here and there. Then I went back over that with more chalk paint, just to knock back any areas I felt looked too dark. I don't use any scientific process; I just keep re-working the piece until it has the look I want. When it dried I finished it with paste wax. The china cabinet before paste wax finishing. The finished piece brings a lot of color to the room. Our entire house is the same color. I know that's good for resale and we really don't want to spend the time and money to paint. We have quite a bit of cathedral ceilings with two story walls and painting is not easy. So we decided to bring color in through the furnishings. I also just happen to adore painted furniture. My grandparents' houses, where I spent most of my childhood, were both full of painted pieces and so it just looks like home. The cabinet after paste wax finishing. 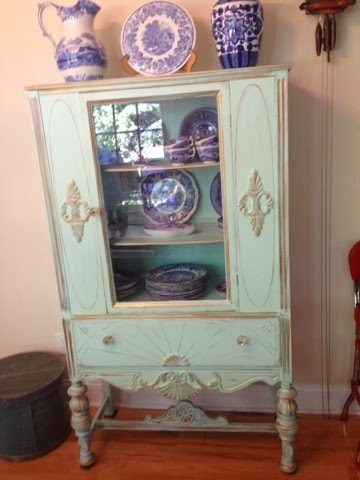 This china cabinet really reminds me of my paternal grandmother. 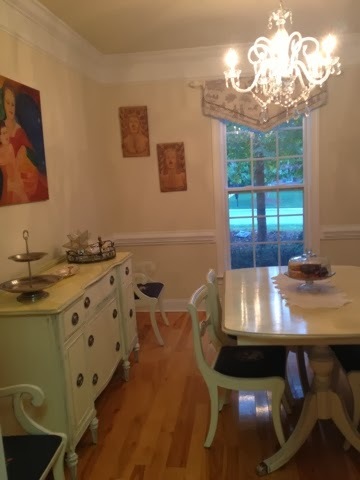 It's funny; her family was all-American, here since before the Revolutionary War, but her decorating style was heavily influenced by the Scandinavian. She was a master at combining furniture genres while still creating beautiful rooms. I wish I could decorate and run a house like she could! 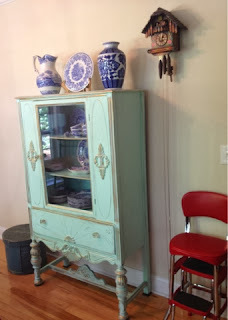 She used color to tie disparate pieces together, and her house had a lot of Swedish Country and French Provincial antiques combined with very slick Danish modern and contemporary pieces. Everything in her house was jade or turquoise or chicory blue, or creamy ivory and she preferred painted furniture accented with metallic gold. Her house exuded a peaceful serenity unlike anyplace I've ever been, except maybe the Ritz-Carlton in Washington, DC. Just walking into that house made me feel pampered and relaxed. The cabinet with the other furniture. My Scandinavian grandparents', on the other hand, also had a house full of every style under the sun, but they made no effort to match anything. They certainly didn't adhere to Danish or Swedish style. My grandmother would say, "We just buy things we like; we don't worry about whether they match." Their house was all brown and red, and the furniture there was painted with patterns like fruits or flowers, very Norwegian, and very homey. I tried to unite our kitchen set the way my American grandmother did, with color. We have the 40s cabinet and the 70s table set, the Early American Shaker cheese box from my grandfather's barn, along with the cuckoo clock and our 50s-style red stool. I love turquoise and robin's egg blue combined with beige and gold, and I also love it combined with red. When I was young I had a blue purse this color I carried with everything and my colleagues at work would joke that I considered blue a neutral color. Actually, I think that's true. I do! The breakfast nook, halfway finished. I think the kitchen looks fabulous so far and I can't wait until it's all finished. I hope I'm feeling better soon so I can get more done. I will keep posting as we finish the kitchen.